Last Friday’s Photo of the Day was entitled, ‘Congregation‘. It was an image taken during the opening session of Laurelville’s Music and Worship Leaders Retreat. (There are few places in the world where you can hear unrehearsed singing like that.) Today, I stacked the chairs from the weekend. 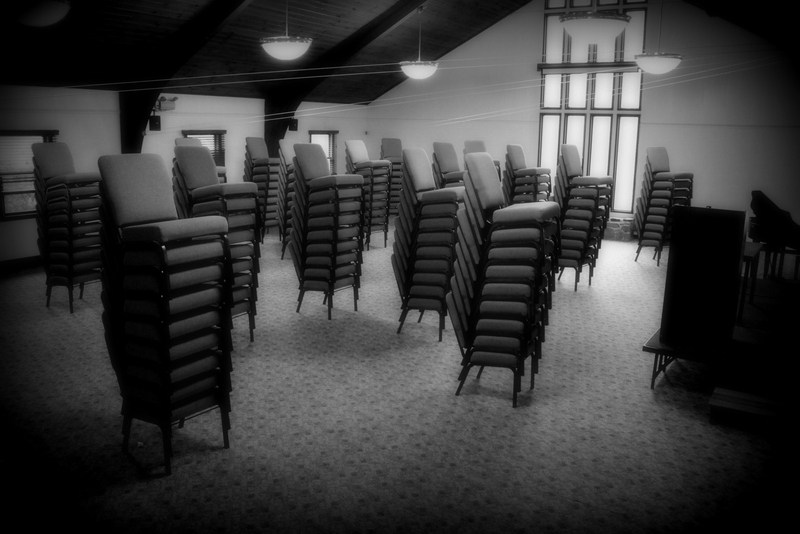 I like the appearance of the forest of chairs, and the B&W and softening effects add a sense of memory, I think. Music and Worship Leaders Retreat ended over a week ago. The entire weekend was predictably awesome, if one can predict such things based on just a single year of previous experience. I’m still scrambling to get my head around everything the resource team had to share regarding our theme of rituals. The weekend was also something of a roller coaster for me – an emotional one brought about by some of the challenging topics we were considering. I’ll begin at the end: that I’m energized and hopeful and looking forward to wherever my journey of faith might lead. But sometimes the short-term is frustrating – really frustrating. This year’s Music and Worship Leaders Retreat is focusing on rituals – on making them alive and on making us alive through them. To expand on Jesus’ words regarding the Sabbath, rituals were created for people and not the other way around. Tonight, we reflected on baptism. How could I tell this child that a drop of water could make her safe? I had no idea what Sasha was going through at home, but I suspected it was rough. And baptism, if it signified anything, signified the unavoidable reality of the cross at the heart of the Christian faith. It wasn’t a magic charm but a reminder of God’s presence in the midst of unresolved human pain. Is this water the water God puts on you to make you safe? I can’t seem to shake the thought that sometimes it is just the opposite. Baptism is the flood that is trying to push me beyond safety, to push me to meet God in the midst of pain, and perhaps to be God in the midst of pain. God has not placed the Church on earth to be comfortable. Our baptism prods us and makes us uncomfortable until we are willing to enter into the pain of the world. So there it is. Lately, I don’t seem to escape these thoughts much. I just don’t know what to do with them. It’s time once again for Music and Worship Leaders Retreat at Laurelville. Last year was the first time that I attended this long running program, and I enjoyed it so much that I immediately started planning to return this year. * For some reason, I’ve ended up with six books** (and a magazine) on my nightstand here. I have no idea how I thought I’d get through six books during this weekend. I guess I never know what I’ll want to pick up. In the meantime, I’ve put together a bunch of interesting and/or thought provoking stuff that I’ve come across recently on the interwebs. Enjoy! An admonition to the new congress to take the Constitution seriously. 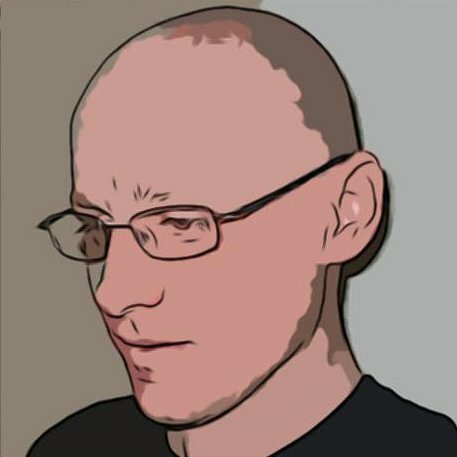 Twelve days ago, my friend died. I had mentioned Bettina and her cancer journey in my New Year’s reflections earlier this year. Since that time, her health gradually grew worse. Two and half weeks ago on Sunday, February 28th, she finished her work in a Lenten worship service that she planned. Bettina shared her story with her congregation and then served communion to them. Having said that good-bye to her congregation (and previous farewells to my congregation and to her work colleagues), Bettina was at peace and ready to go home. Six days later on Saturday, March 6th, Bettina died, surrounded by friends and her adopted family. There is so much more that I could write. Perhaps I will in the coming days. But in the meantime, here are some reflections that I shared last night with my congregation. Every Wednesday during Lent, we’re reflecting on the theme of “Holding On and Letting Go”. It turns out that this has been a very meaningful theme for me. 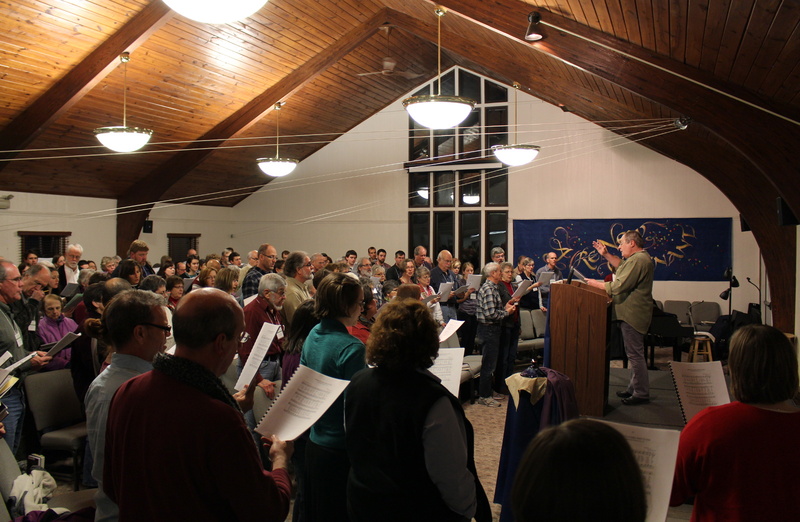 In late December last year, I was looking forward to Music and Worship Leaders’ Retreat at Laurelville Church Center. The retreat is a weekend workshop in early January with an intimate atmosphere and wonderful time of worship. It is also a great resource for people who will be involved in planning services during the upcoming Lenten season. At nearly the same time that I was preparing to attend the retreat, I also learned that Bettina’s cancer had returned. I realized then that the theme of “Holding On and Letting Go” would take on greater significance this year, and that I would begin my Lenten journey in January, instead of February. This morning as I was reflecting on the Times Square festivities, I wondered if our society doesn’t so much mark the passing time at New Year’s, as it tries to stop it, to turn back time, and to be young again. Maybe not. Perhaps we don’t do those things any more at New Year’s than we do the rest of the year, and maybe this is a time for positive change. But I wondered anyway. Part of my wondering is because I have a friend with cancer. Last year was a time for fighting it, and for hopes of remission, but she recently learned that the cancer has returned. For her, 2010 won’t be a time of turning back the clock. Instead, it will be a time of dying. I went on to make my resolutions for the year, which included walking with and learning from Bettina in her dying, and walking with and learning from my daughters in their living. Ultimately, I think that this is what Lent is about: living and dying, and maybe not in that order. Jesus died well because through dying he sent his Spirit of Love to his friends, who with that Holy Spirit could live better lives. Can we also send the Spirit of Love to our friends when we leave them? Frankly, I think that this is one of those things that the world regards as foolishness. The world fears death; it glorifies youth and beauty; and it doesn’t care to talk about dying well, at least until forced to – and by then, it may be too late. But it seems to me that Bettina died well. For one thing, she showed that death has lost its sting. I’m sure she had fears that I never observed. However, I witnessed a profound peace about her – the peace of someone who was learning to trust the tender care of Jesus – Jesus, her lover – who walked with her, who had faced death, and who had shown that death is not the final word. Bettina also demonstrated reconciliation for our congregation. When she spoke to us three and a half weeks ago, she didn’t minimize the challenges that we still face, and she didn’t ask anyone to change their beliefs. But she showed us through her humble example that to be a community we must be willing to forgive, to seek forgiveness, and to be forgiven. There is one more part of Bettina’s dying that amazes me – a gift that she gave. As the cancer became stronger, she put her life in the hands of her friends. She gave them her trust – trusted them to care for her – and allowed herself to be served. And by serving her, they served Christ. We hear echoes of Matthew 25: “Just as you did for one of the least of these who are members of my family, you did for me.” How precious is that gift – to serve our Lord? It’s not a gift that one could request, but neither is it a gift that one could refuse. Here is something that is a mystery to me: When you see Jesus in another person, serve Jesus by serving that person, and then that person dies, it may seem as if Jesus dies, as well. And isn’t that also the culmination of Lent? That on Good Friday, God dies? This is a part of our faith that makes little sense. At that point, what remains, except doubt? But I’ve begun to believe that doubt is holy, because without doubt we’d never have faith. The death at the end of life won’t be so fearful if you can die well now. Yes, the real death – the passage from time to eternity, from the transient beauty of this world to the lasting beauty of the next, from darkness into light – has to be made now. And you do not have to make it alone. God has sent people to be very close to you as you gradually let go of the world that holds you captive. You must trust fully in their love. Then you will never feel completely alone. Even though no one can do it for you, you can make the lonely passage in the knowledge that you are surrounded by a safe love and that those who let you move away from them will be there to welcome you on the other side. The more you trust in the love of those God has sent to you, the more you will be able to lose your life, and so gain it. Success, notoriety, affection, future plans, entertainment, satisfying work, health, intellectual stimulation, emotional support – yes, even spiritual progress – none of these can be clung to as if they are essential for survival. Only as you let go of them can you discover the true freedom your heart most desires. That is dying, moving into the life beyond life. You must make the passage now, not just at the end of your earthly life. You cannot do it alone, but with the love of those who are being sent to you, you can surrender your fear and let yourself be guided into the new land.